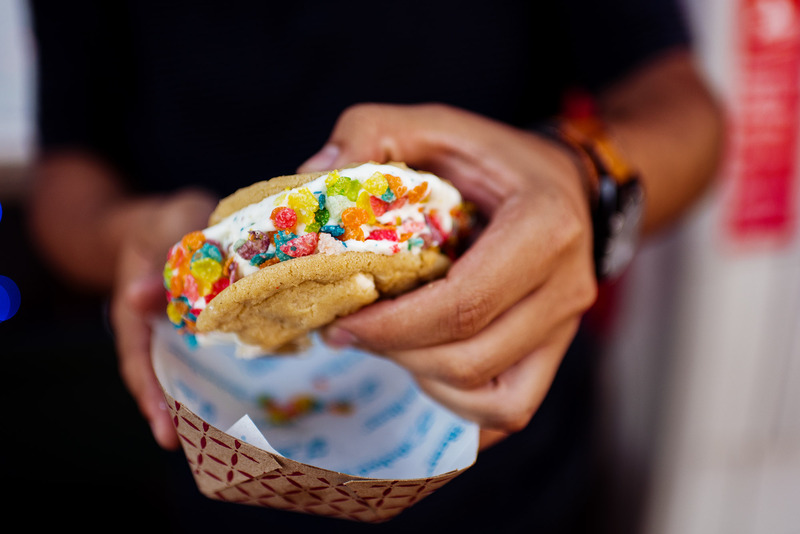 Have you guys tried the new ice cream sandwich shop in Downtown Tempe yet? 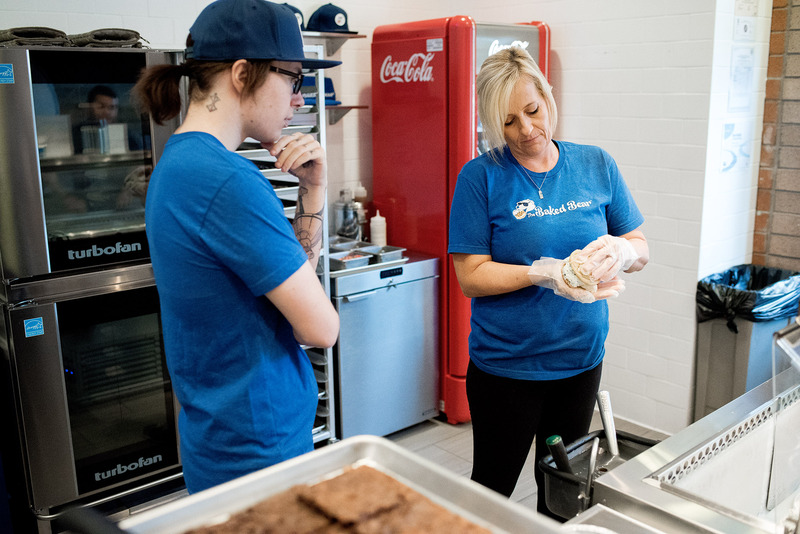 We swung through Baked Bear to get the low down on their 4-step dessert building process! It’s interesting (and admittedly very fun) when you step into a business and see a sign with a 4-step process to make their product. Step 1: Choose your top and bottom. Well, I’m not sure whether I feel like jeans or shorts today. Since I didn’t shave my legs, I choose jeans. And a nice comfy T-shirt for my top. Oh, wait. We’re not talking about clothes are we? But I’ll play this game. Here are my choices: a cookie, a brownie or a donut. A donut?!! Egads, so many choices! Ok then, it’s either going to be the Oatmeal Cinnamon cookies, the White chocolate macadamia nut cookies. Or maybe the gluten-free chocolate chip. I have to watch my gluten intake ya’ know. Or maybe a brownie top and cookie bottom?! AHHH! I’ll go with the Snickerdoodle. 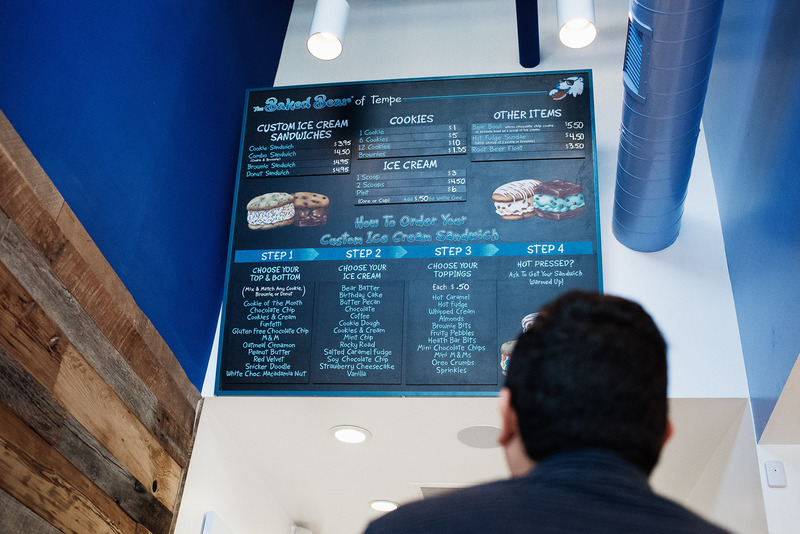 Step 2: Choose your ice cream. I choose Salted Caramel Fudge. No, scratch that. I choose Birthday Cake. Umm. Nope, make that Strawberry Cheesecake. Definitely Strawberry Cheesecake. Step 3: Choose your toppings. 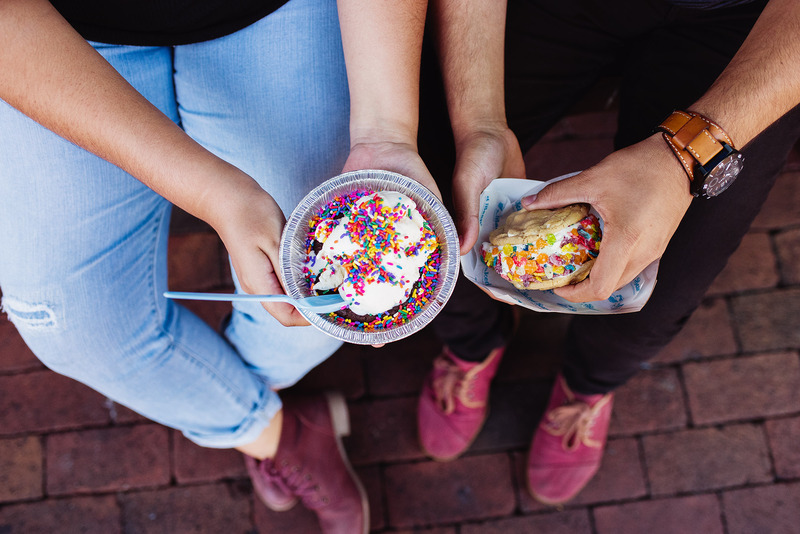 This is a hard one: almonds, brownie bites, Fruity Pebbles, Heath Bar bites, hot caramel, hot fudge, mini chocolate chips, mini M&Ms, Oreo crumbs, sprinkles, whipped cream, Brussels Sprouts. Just kidding. I choose Fruity Pebbles, but will definitely be back for a hot fudge + Heath Bar combo. Time to hoover this down. What’s that you say? There’s a 4th step? How did I miss that? Step 4: Hot pressed? Yes, I’m hot pressed to eat this enormous concoction. Wait, what? You can warm this up for me? Amazing! And that’s great, because it gives me time to run over to DIVAZ and get a new pair of jeans that will fit after I inhale this beautiful piece of art I’ve created thanks to your 4 step program. A whole new meaning to tops and bottoms. Delish! 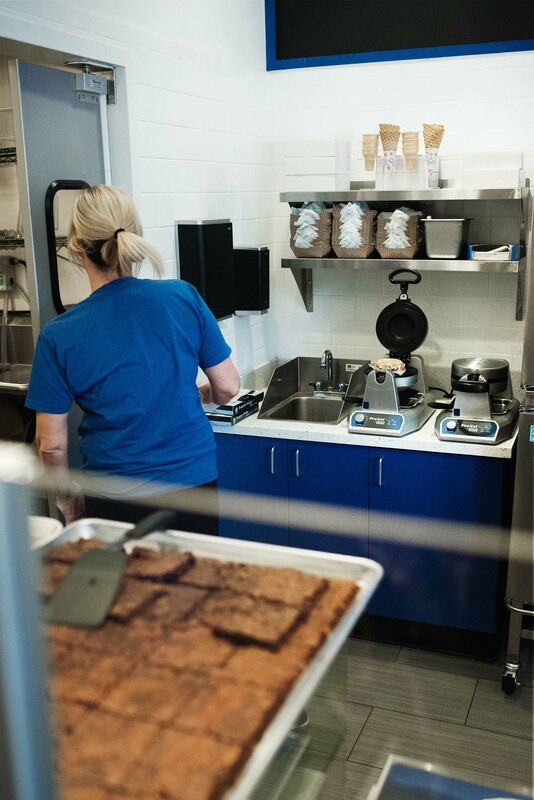 What mouth-watering hot-pressed cookie + brownie + ice cream sandwich concoction have you created? 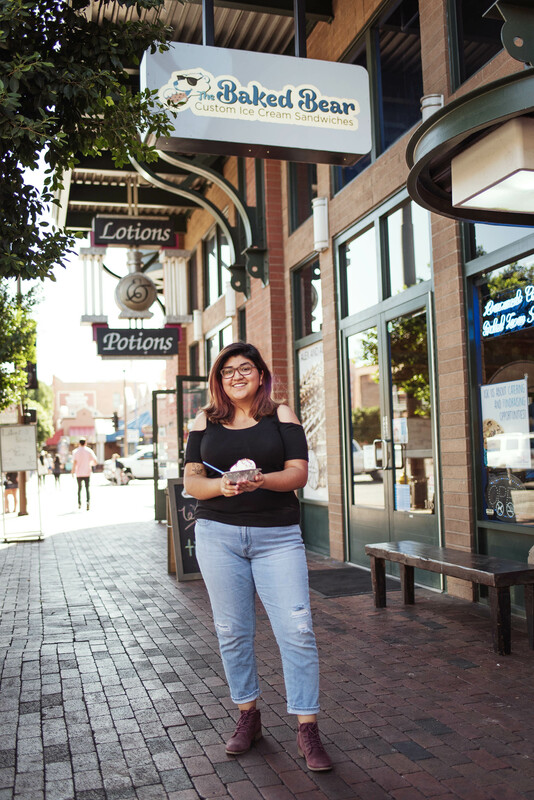 Share a photo of your masterpiece with us on Facebook, Instagram, or Twitter by tagging it with #DowntownTempe !